Tappan Hill Mansion is a dream location for wedding day photos. Why do so many couples fall in love with this beautiful place to get married? Even the name includes a mansion, driving to the hall you get there and see this stunning historic place which was actually the location of Mark Twains former estate so there is tons of history behind it. . The first time we came to capture a wedding at Abigail Kirsch At Tappan Hill Mansion we fell in love. 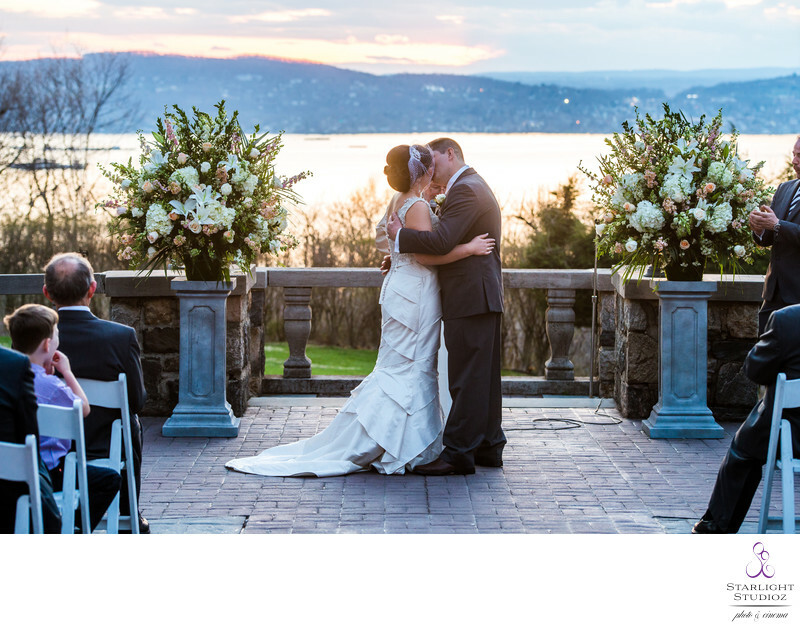 It really is a dream location for your wedding.The beautiful outdoor area is setup for the perfect ceremony location overlooking the Hudson and when the sunsets it is a sign to be seen.The sun began to set during the ceremony, just wow!!! Never seen anything like it. We could have spent the entire day just taking these gorgeous photos behind this stunning backdrop. We started the day with the bridal preparations at a nearby Westchester hotel.The bridal finished her prep and putting on the dress once she arrived at Tappan Hill in the bridal suite.The first look happened at the bottom on the staircase and the groom Gareth waited for Daphney to walk down the stairs.She almost fell once she reached the bottom but he saved her just in time like a princess she came down for their first kiss.It was just perfect.We took photos in this main area and then headed outside to take wedding photos outside this castle looking wedding venue. Abigail Kirsch event venues that offer the most beautiful locations on top of being some of the best catering you will have at a wedding. Abigail Kirsch at Tappan Hill Mansion has 2 reception rooms perfect for wedding reception photos: includes the Pavilion room which can accommodate larger weddings and the Hudson room for smaller weddings. In case you don't want to get married there and have spectacular wedding photos captured at their venues you can opt for of site catering through Abigail Kirsch.